Late night: Bunshun releases article detailing Sutou Ririka’s sleepover at a man’s house on the night of 8th May 2017. When confronted, she explained that it was a “friend”. No comments from agency. The man is in the medical/pharmaceutical industry. Edit: Agency has confirmed her statements. Oshima Yuko was doing an instagram live and expressed her feelings by showing her cap. Takamina says her feelings are the same as Yuko’s white cap. Secondary reaction: That’s….a joke right? 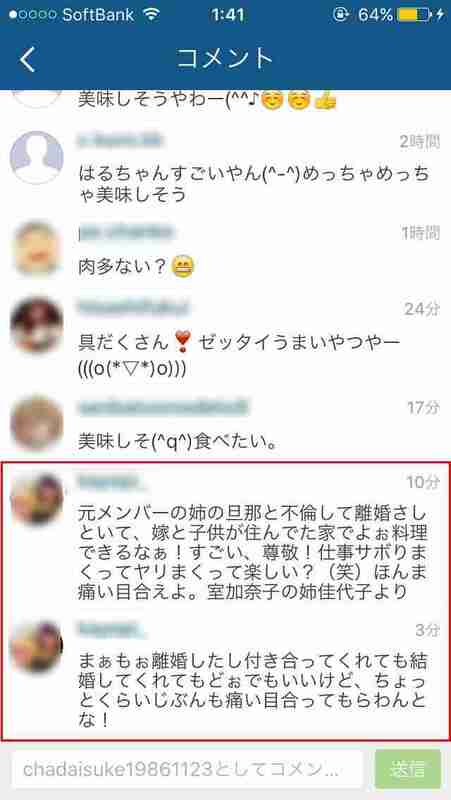 Final reaction: Wells, this is how 48Group has degraded thanks to Sashihara and her fans. And that is why Okada Nana and Takahashi Juri are openly venting their frustrations in their speeches. Gesu no Kiwami Otome vocalist Kawatani Enon(27) has sent a fax to the media announcing his hiatus. 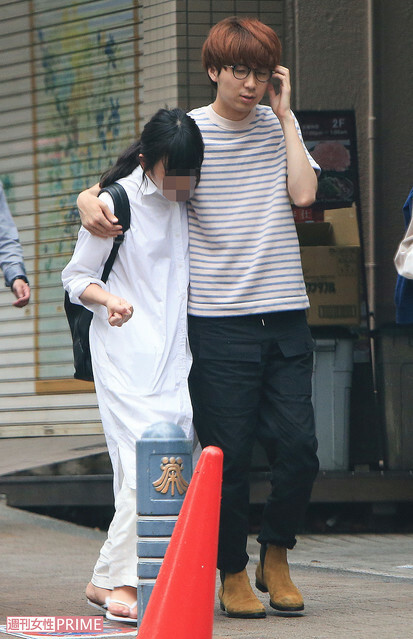 This comes after he admitted to drinking with underage talent Honoka Rin(19), his new girlfriend. According to Bunshun, the 2 met each other at a bar “P” in Sangenjaya. They are said to be living together and were spotted going on a overnight trip with a group of friends to Tochigi, where they picked fruits and enjoyed the onsen. Both their agencies confirmed their relationship, with Honoka’s side also admitting that she is currently living in Kawatani’s mansion. Now Becky seems like the pitiful one..
With Gesu no Kiwami Otome vocalist Kawatani Enon officially divorced and Becky’s return to TV, i will make a final post on them and move on. Becky made a return to TV on 13th May, appearing on Nakai Masahiro’s “Kin Sma”. MC Nakai and Becky had a heart to heart talk about her scandalous affair with Gesu no Kiwami Otome vocalist Kawatani Enon, which tabloid Bunshun exposed at the start of 2016. Becky: Next week i got permission to apologize directly to his wife. Nakai: What’s this? When did this happen? Becky: His wife.I intended to cut off all ties with the Guy, if possible i’d like it to be 1-on-1 with her, i said so selfishly. Even though i came from the stance of having to apologise. Nakai: I also think that your way would be better..
Becky: Yes. After some time, i asked again and got permission. So it’d be next week. But that’s a place where i communicate my feelings to his wife. I have nothing to say to the Guy. Nakai: It’s been long since u ate with someone? Nakai: There is one thing i hope you’ll abide by today. I hope you don’t lie. Nakai: But if there’s something you can’t talk about, i hope you can be direct about it and just say “I can’t talk about it” without lying. I think that’d be better. I feel like there’s alot of things you can’t say. Nakai: What was tough for you? Becky: I was the one who hurt others, so i’m not in the position to say, but it was the guilt from hurting another woman in this way, and the strict frank words which came my way. I caused confusion and sadness to alot of people, I couldn’t work, and the reality of my love not turning out the way i imagined. Nakai: Becky’s feelings…only Becky will know. As for your fault, perhaps it’s only your fault. What did you do that was bad? Becky: Falling in love with a guy with a wife, hurting his wife deeply. Hurting people related to my work, and my fans. Nakai: Did you lie in that press conference? Becky: Yes. Meeting that guy and liking him, going out with him… after that I came to know that he had a wife. But, because i knew both of us had feelings for each other, i told him “Then lets date after you get divorced”. Nakai: You realised that you messed up the order in the midst of it. Becky: Yes. It’d be great if i had braked at that point. Whilst agreeing to being just “friends”, we met time and again, my feelings also grew by the day. Honestly, it became really complicated. During the press conference, saying we’re not dating was half a lie, but saying we’re not dating is also somewhat true. Nakai: But you liked him, and he liked you. Nakai: Were you not in love? Nakai: You were in love, but not dating? Becky: That sounds like a childish excuse. Nakai: That’s it. That’s kind of….It’d be better if you were clearer about it. Going on trips, and still saying you’re not dating, that wouldn’t be accepted..
Nakai: You were dating right? In terms of feelings. Becky: Yes. I think we were cheating at the point when our feelings were known to each other. Nakai: So after your press conference, the LINE conversations were leaked? What came out? Nakai: Are you still seeing him now? Becky: No. We stopped contacting from mid January. Nakai: Was that because of the enviroment, or simply because you don’t want to? Becky: The week after the reports came out, his wife’s interview was published. That was when i first came to know about her feelings. I realised how i hurt his wife..and how big my mistake was. I realised this love was wrong, so i stopped contacting him. Nakai: Why is it wrong? Becky: Because i realised i spoilt the relationship between a married couple. In time, we might break up, even though the order was wrong. In the interview, his wife had feelings for him. She also looked forward to visiting his hometown in Nagasaki. I realised i’d done the worst thing. Nakai: When was that? During New Year? You already knew he was married? Becky: Yes. I really committed the worst mistake. I wasn’t able to think from her perspective. I was only thinking about myself. Nakai: Why did you go to his hometown during the New Year? Were you prepared to offer your greetings somewhere? Becky: He invited me to meet the kids of his relatives, so i went. It was a place that i couldn’t go in any case. My feelings grew so much that i couldn’t see what was around me. I didn’t have the courage to turn him down. If i did, i was worried that his feelings would also leave me…i’m really ashamed of myself. There were so many chances to put a brake to it, but i didn’t. Nakai: You don’t love him anymore? Becky: After the news reports, i still loved him. Frankly, after everything died down months later, i had thoughts to meet him and start a relationship. I thought otherwise after learning of his wife’s feelings and seeing what a huge mistake i’ve made. Nakai: So a love that can’t be pursued=not liking someone immediately? Becky: It doesn’t happen in a second. Firstly, in my head i’d be thinking “i don’t love him, i don’t love him”,after that my heart might have followed. Nakai: Now, do you love(him)? Nakai: Right. Even though you loved him so much in the past. Nakai: It was a huge 6 months. You had a very sincere image, but you were not decisive enough during the press conference. The betrayal is something that can’t be denied – to the people who watched it. Becky: To the fans, and people of the world, sorry for causing so much trouble. There were alot of mistakes in that press conference in January. I’m in the industry where i communicate, but i didn’t tell the truth. I’m reflecting deeply. As a human, a professional, i committed the worst. I am reflecting for hurting so many people. I hope to earn your forgiveness but, i hope you’d also allow me to restart my TV work from zero. Nakai: You didn’t lie today right? Becky: There’s no lies. I won’t betray again, really sorry. Nakai: I think you’ve really learnt your lesson this time so i think you’ll carry these feelings for awhile. You’ll get bashed too so ..lets work hard together! After watching today’s broadcast, i feel like i have to write this no matter what so i posted this without informing my agency. Firstly, the contents in LINE which Bunshun Shukan published was all real. Initially, the fax from me telling everyone i was only friends with Becky – that was a lie. We were in a relationship. I am really sorry about lying. I told her we would be friends until i got divorced. I didn’t see what was around and didn’t consider the feelings of those around me. I caused 2 people to be unhappy. Threading on my wife’s feelings, bringing Becky to my hometown – that was my decision. To both my wife and Becky, i’m really sorry for that. This is not limited to my wife, Becky, the fans and relatied personnel. I shouldn’t have said it in public, i also did not have the rights to say it. In the end, more misunderstandings followed. I was too childish and i’m reflecting. Also, as to why I’m not on hiatus while Becky is already doing so. There is no other reason other than the fans who have waited for me. I can’t betray the fans who are willing to listen to my music. It may sound all pretty, but i just wanted to sing the songs that i’ve created with the members. I may sound selfish, but that’s the reason. I did have an affair with Becky, gave my wife distress and cheated on her. I caused alot of confusion to my members, the staff, related personnel, my fans and Becky’s fans. Really sorry. I’m sorry for releasing this post at this timing. From now, i will face fans properly with our music, and work hard in both indigo la End and Gesu no Kiwami Otome. Please take care of me. NMB48 underage member Kinoshita Haruna(17) is alleged to be in an affair with Estate24 CEO Akita Shintaro(28+). In a 6th May live streaming on NicoNico, Bunshun showed photos of the 2 walking in Shibuya and said they stayed over in Ritz Carlton Hotel in Roppongi. 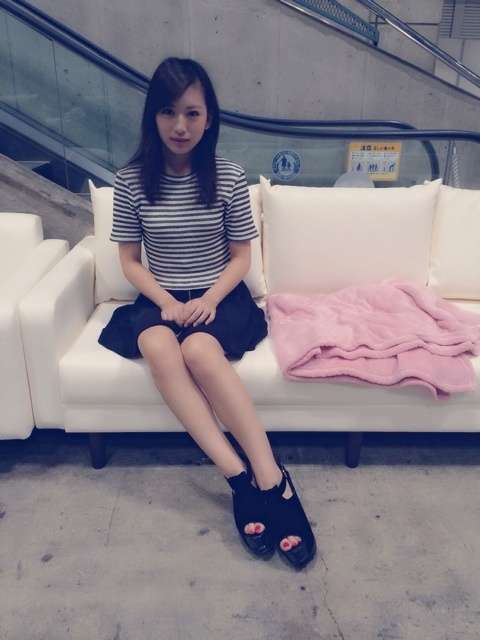 Shoes and handbag are similar to what Kinoshita showed off in her blog. For other pics, please check here. 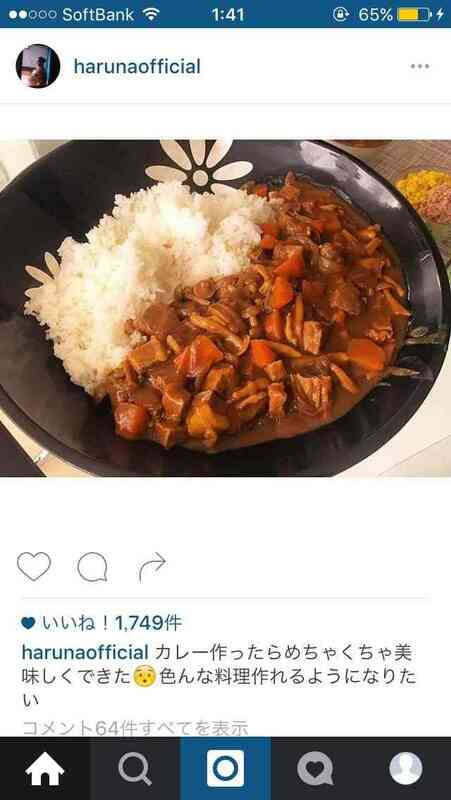 On 19th April, Kinoshita posted a photo of homemade curry in her Instagram, commenting on how delicious it was and how she strives to be a better cook. What attracted eyeballs was an angry comment left on that post.